Banker, housewife, engineer, pujari. They came from all walks of life, from across Maharashtra, and met up for the first time in a public meeting at Mumbai's Shivaji Park. They exchanged notes, bonded, and vowed to work together. Each of the 60 people gathered under the Mobile Tower Grievance Forum had their own story to tell. They told stories of their battle against illegal installation of mobile towers, of money power, and of cancer, brain tumour, skin rashes and insomnia caused by the towers erected atop apartment buildings. The narrations cemented the group and the meeting culminated in an action plan that included selecting a 10-doctor team to document the impact of radiation from towers on people’s health. When the meeting started at 10.30 am on December 13 last year, the dilemma was palpable. Stray comments could be heard saying towers are needed to transmit the signals from cell phones. But as the discussion progressed, the ambiguities evaporated because many speakers said the law was clear: before installing mobile towers near residential areas, companies have to get a no-objection certificate from the residents’ cooperative society and permission from the municipal corporation and the pollution control board. There should be a gap of 36 metres from human habitation, the law stipulated. With the law on his side, S S Londhe, 78 and retired from service , is waging a lone battle; no one in his building talks to him and his family from the time he thwarted installation of a mobile tower in his building. “When we try to reason with them we are told to go and buy a flat elsewhere,” Londhe said. The law does not help much, he added. “Companies first erect the mobile towers and then get them regularized by paying the municipality a fine of Rs 5,000,” Londhe said. If a survey were to be carried out, Londhe was certain, it would show most mobile towers are illegal. The Londhes live on the top floor of the seven-storey Clement Court in Mumbai’s Dadar West. 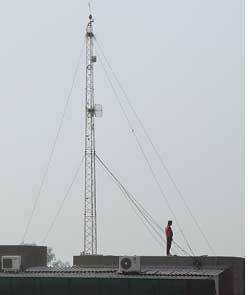 In late 2008, a mobile phone company approached the housing society for installation of a tower on top of the building and offered Rs 3.5 lakh a year as rent. In April 2009, during the housing society meeting, the Londhes opposed the tower. They were the only family to do so; all others were in favour of the tower, and the rent money. When Londhe showed them write-ups on radiation from towers, they laughed it off as “internet crap”. On June 6, last year, by way of the majority, the society cleared the proposal to install a tower. Construction material was offloaded at the site on June 19. “But we were adamant,” Londhe said. “My son and I filed complaints with the municipal corporation. We also filed right to information (rti) applications to know how the authorities sanctioned the tower. I also filed police complaints.” Construction has been stalled for now. “But it has not been cancelled yet,” he added. “Sometimes my son has to leave work at office and rush home to ensure the construction work does not begin illegally.” All this has paid off to the extent that in December, the company took back the construction material. Listening to Londhe speak Vijaya Bhat, who came to the meeting with her husband Rajesh Bhat, commented she did not even get a chance to oppose the mobile tower in her building. When the residents moved in, they found the builder had already installed a mobile tower. The Bhats came from six-storey Riddhi Park building in Thakurli West, 50 km from Mumbai, to tell the story of Vijaya’s brain tumour which they suspect is linked to radiation from the tower. Rajesh is a Hindu priest and his wife Vijaya a homemaker. “Within four months of occupying the top floor flat, I began to fall sick. Tests showed I had brain tumour,” said Vijaya Bhat, 33, addressing the gathering. She was operated last year at a cost of Rs 10 lakh. The Bhats don’t live in their apartment any more; they have moved to a rented one. “My health is improving now. But even a day’s visit to the place I thought would be my home, makes me sick physically,” Vijaya said. Her husband became agitated as Vijaya finished speaking and started hurling abuses at the government and at the politicians present at the meeting. “Do you understand the problems we common people have to face because of mobile towers? We have to suffer and die,” he burst out. The Bhats are not the only ones suffering in the Riddhi Park complex. Rajesh said their neighbour is suffering from cancer of the spinal cord. Another neighbour gave birth to a child with birth defects; the child died soon after. He believes all this is linked to exposure to radiation from the mobile tower. “People are afraid of coming out and speaking openly against the tower,” Rajesh Bhat said. The forum of people taking up cudgels against mobile towers is the brainchild of Milind Bembalkar, mechanical engineer who runs his own business in Latur, 750 km from Mumbai. He has been writing articles on the menace in Marathi newspapers and magazines for the past one year. When in one article Bembalkar asked readers affected by mobile towers to get in touch with him he was surprised to receive 300 letters. “I also received phone calls from all over Maharashtra expressing concern and helplessness. That was how the forum was born,” Bembalkar said. Ramchandra G Pradhan, 83 years and a journalist, came to attend the meeting with plenty of reading material on the ill-effects of radiation from mobile towers. He resides in Thane district’s Bhavani Society. He erupted with skin rashes a year ago; these, he told the meeting, developed when a Bharati Airtel tower was installed atop his building. “We need to be aware of side-effects of radiation and then raise questions in the Assembly,” he said. Pradhan then lifted his shirt and showed the rashes all over his body, which he claimed, disappear when he stays away from his house. “My doctor has confirmed these rashes are linked to radiation from the mobile tower,” he added. The forums’ first meeting ended with the release of a list of people who claimed they were suffering from sleep disorders, restlessness and fatigue since the time a mobile tower was installed on their building. They decided to first build a body of well documented case studies with doctors analyzing the cases; armed with facts on people’s suffering members said they would take the battle to its next stage.